It's nearing the end of September which means it's almost Bookclub time again!! This Friday (September 24th) we'll be posting our bookclub entries for September. And you should join in the fun. I've mentioned before that I'm tickled to be part of the Bookclub Bloggers (a super cool group started by Charlotte at The Daily Snapshot). Please know, the invitation is WIDE open to you too. The more the merrier. In case you're wondering, this month's selection, Maniac Magee was chosen by Katie (the co-founder of BCB) at Life of Piefairy. Maniac Magee was a legend. Kids were always talking about how fast he could run; how high he could jump; how no knot would stay knotted once he began to untie it. 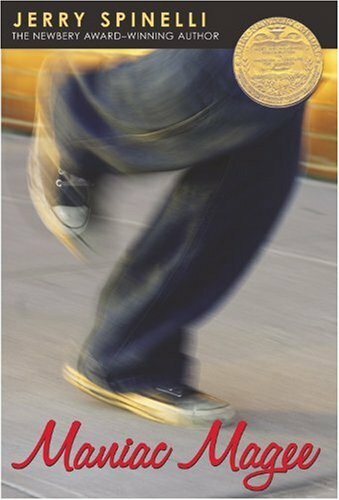 But the thing Maniac Magee was best known for is what he did for the kids from the black East End and those from the white West End of Two Mills. Maniac Magee was special. Since the book is young adult level it's proving to be a really fast read. Come on now, don't you want to be a joiner?